The training offers practical help and a basis for group work and the coordination of leaders in Poland. The training courses take place during three weekends in the year at the Polish Centre of the Schoenstatt Familiy. People from Poland, Russia, Belarus and Belgium, who understand Polish, take part. 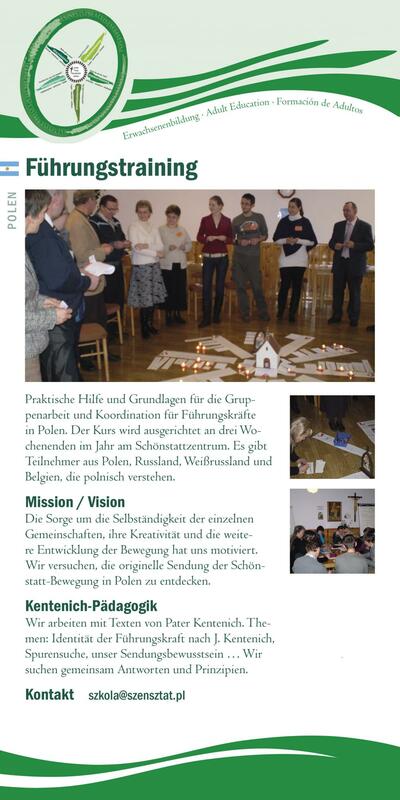 The concern for the independence of the individual communities, their creativity and the further development of the Movement has motivated us to attempt to discover the original missin of the Schoenstatt Movement in Poland. Method: We work with texts taken from Fr. Kentenich’s works. Subjects: Character of leaders according to Fr. Kentenich, searching for God’s traces, our sense of mission... All work together to search for answers and rules.